Sara has invested years dutifully climbing the corporate ladder to become head of PR at a major financial services company, but can't shake the feeling she's not where she belongs. When her latest boss, a wine-guzzling, drama-loving diva, finally drives her to the brink, Sara seeks sanctuary in yoga-teacher training...only to encounter an entirely different assortment of craziness and calamity. Where in the OM Am I? 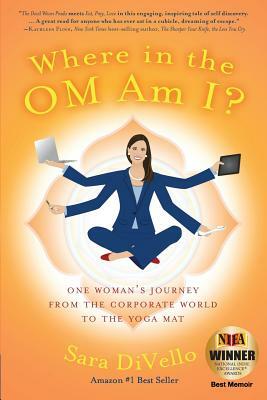 is an irreverent, honest, and hilarious memoir chronicling one woman's journey from the fast-paced, cutthroat corporate world, to the slow-paced, surprisingly catty, and sometimes perilous world of yoga. Along the way, Sara confronts the harsh reality of working in a male-dominated industry, the challenges of being a corporate interloper in the yoga community, and the complexity of interactions between women in both realms. As epic mishaps beget personal revelations, Sara digs deep for the courage to forge a new life for herself.